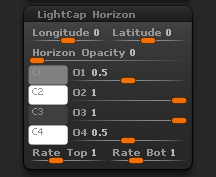 The LightCap Horizon sub-palette includes functions for manipulating the orientation of the LightCap, and for creating and adjusting a Horizon Line. The Longitude and Latitude sliders allow you to rotate your LightCap on the horizontal and vertical axes, effectively changing the lighting direction. This is a great and quick way to change the global light and color orientation of your LightCap, letting you create variations in just a few clicks. The Horizon opacity slider displays the horizon line which is composed of two gradients above and below the median line. The slider value sets its over all visibility. For adjusting the individual colors, see below. Use the C1 to C4 color selectors to define the start and end colors of the bottom to top gradient of the horizon line. Use the O1 -O4 sliders to adjust the opacity of the corresponding C1 – C4 colors. The Rate Top and Rate Bottom sliders set the gradient change rate for the top and bottom portions of the horizon.